I'm rehashing this blog post from my old blog about Marcella Hazen, who died recently. Her Chickpea Soup With Arborio Rice is still one of my favorites, and I will honor her memory by making it again this week. When I became gluten-free, it was comforting to know that I could still eat this hearty and easy to prepare chickpea soup. Marcella Hazan is my Julia Child. 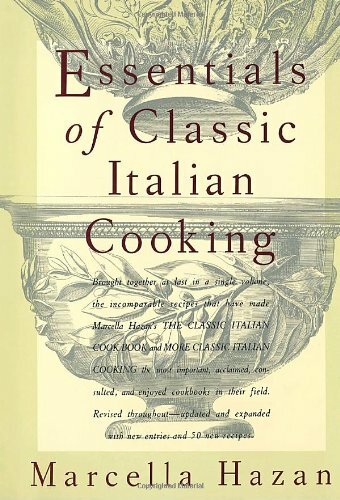 I’ve cooked and eaten my way through much of Essentials of Classic Italian Cooking and learned, as they say in the musical Nine, how to “Be Italian,” from this 1992 classic cookbook. Ever the groupie, years ago I even went to see Ms. Hazan give a lecture at New York’s Metropolitan Museum, which goes to prove that cooking Italian food is a fine art. I remember a man in the audience asked her what her favorite recipe was for clams. She looked at him like he was crazy for asking such a question and said, “It depends what you’re in the mood for at the time,” an answer that only an Italian could give. It made perfect sense to me, even though I’m not Italian. (Although having been to Italy at least a dozen times, I like to think of myself as an honorary Italian). I love this cookbook because as a home cook who grew up on Poptarts and canned vegetables, it taught me that if you respect your ingredients – the best meat, fish, fruits and vegetables, cheeses and herbs you can afford, there’s not a lot of fancy cooking you have to do. Now that the weather is finally turned a bit colder, I went right to my Marcella Hazan bible and opened it to the Chickpea Soup with Arborio Rice recipe, which tastes almost like a risotto. It’s one of our winter staples, with a salad and it will always be remembered as the recipe that got my daughter to become a fan of chickpeas, a good source of protein and manganese. It’s a stick-to-your-ribs kind of dish that even Julia Child would love. This is one of those really easy soups to make when there’s nothing to eat and you look through the pantry, and voila, there are all the ingredients. When I make this soup, I add a rind of parmesan cheese that’s usually in the refrigerator to act as a bone and give it some depth. Put the garlic and olive oil in a pot that can subsequently accommodate all the ingredients and turn on the heat to medium. Saute the garlic cloves until light brown, and then remove from the pan. Add the crushed rosemary leaves or the sprig, stir, then put in the cut-up tomatoes with their juice. Cook for about 20-25 minutes until the oil floats free from the tomatoes. Add the drained chickpeas and cook for 5 minutes, stirring. Add the broth or bouillon, cover, and simmer for 15 minutes. Puree about half of the soup. If soup is too thick, add a little more water or broth. Taste and correct for salt. Add pepper. Puree all but a quarter cupful of the chickpea soup with an immersion blender or use a food processor. Add the rest of the soup or the dissolved bouillon, and bring to a steady, but moderate boil. Add the rice, stir, cover the pot, and cook, letting the soup bubble steadily, but moderately, until the rice is tender, but still firm to the bite. Check after about 10-12 minutes to see if more liquid is needed. If the soup is becoming too dense, add more homemade broth or water. When the rice is done, swirl in the olive oil, then taste and correct for salt. Let the soup settle for two or three minutes before serving.